Online dating has become the new normal. If you’re going to be looking for Mr. or Mrs. Right on Tinder, Bumble, or other dating apps, it’s important to take steps to protect your privacy. Between ride-sharing, secondary email accounts, and a second phone number from Burner, there are many tools at your disposal. The trick is to know how to use them. Following these tips will help keep you safe when you’re trying to meet new people. Start by limiting what personal information you give out by default. Beware when giving out your home address, work address, personal phone number, or other identifiers. You should also be careful not to share this information on your social media sites or elsewhere online. You never know who might search for that information, looking for you. If you’re not sure how much information is already available about you online, take the Burner Challenge. In the beginning of a new online relationship, stick to the chat function within the app. When you’re ready to move to the phone (or if you just prefer texting), give your new acquaintance a Burner number. That way your personal number—and all the attached info about you—stays safe while you get to know the other person. Once you’ve vetted someone and are relatively sure that they’re trustworthy, you can consider sharing your personal phone number or additional private information. Your instincts are there to protect you, so it’s important to listen to them. If your gut is telling you to run for the hills, you have a few options. First off, you can distance yourself from that person. Burner makes this easy. You can always Burn a number and grab a new one. Problem solved (at least on the phone calls and text messages front). Additional measures can be taken if you decide it’s necessary, such as blocking a number or using Ghostbot to handle unwanted texts. 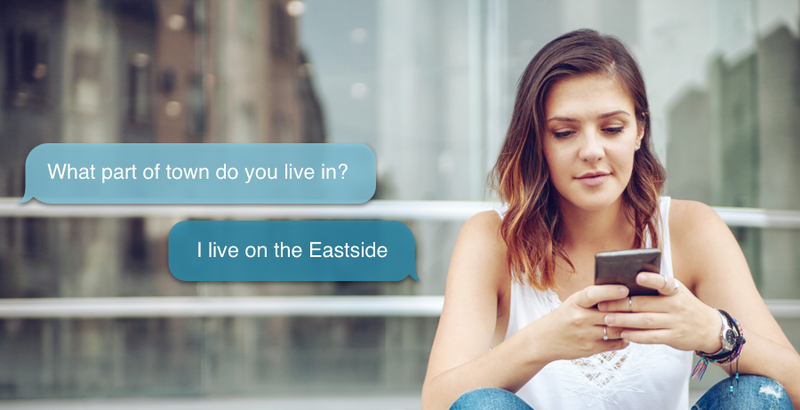 Ghostbot is an intelligent auto-responder that helps you carefully distance yourself from a person sending you unwanted messages. If you’ve decided that the person you’re talking to is safe enough to move the conversation outside of the dating app chat function, you still might not want to share your personal email or phone number with them. We’ve already mentioned Burner for second or alternative phone numbers but you may also want to consider maintaining a secondary email account to share with potential dates. Gmail, Yahoo, Hotmail and several other providers will happily give you a brand new email account free of charge. Even better, Google just made Gmail the most secure email provider on the planet. As long as it’s not your personal email you’re giving out, you still have a layer of privacy between you and new people and you can always change the email address if it falls into the wrong hands. As old-fashioned and adorable as it is to let your date pick you up at home, it adds risk. Not only do they know where you live, but if the first date goes badly, how will you get home? Always have a plan B. In the day and age of ride-sharing and cell phones, there’s no excuse for getting in a car with a stranger. And always use a Burner number if Uber or Lyft (or other ridesharing app) drivers ask for a contact number outside of the app. When you decide to meet your online date in person, set up a safety net, so someone knows where you are and when you’ll be back. Whether it’s your roommate, best friend, or mom, tell someone where you’re going and when you’ll check in (by texting or calling). There are also apps out there that can alert emergency services or your trusted contacts, if you turn it on. Think of it like a panic button. There are many of these on the market such as Kitestring or BSafe. As a last resort, if you’re in a public space, don’t hesitate to let someone know that you don’t feel safe. If your date is making you uncomfortable, excuse yourself to go to the bathroom and notify the bartender, server, or other personnel that you don’t feel safe and need help to leave without making a scene. Just knowing that someone else is watching out for you can make you feel more comfortable about making the leap to meeting people in person. How many friends do they have on their social media account(s)? Are those friends all men or all women? Do they have multiple profiles on one social media platform? Do they have profiles on multiple social media platforms? Do they interact with friends online? You can never be too careful. There are a lot of tools online for checking to see if someone is who they say they are. It’s okay to take your time early in a relationship to build trust. Don’t just text, either. Why not try the old-fashioned approach and have a simple phone call with someone before meeting them in person? What about video calls? Surely someone who is being honest with you and likes you for who you are can’t refuse a simple request like that. It can be a good screening mechanism -- if someone doesn’t want to show your their face over a video call or let you hear their voice over a phone call, they might be hiding something about their identity. Just don’t. Anyone who asks for money should send up an immediate red flag for your finely honed gut instincts. If you have good reasons to give someone money (for example, splitting a meal or movie tickets), use cash or a secure peer-to-peer payment app like Venmo. Finally, if someone is trolling you or you don’t want them around, don’t be afraid to block them and report them if appropriate. Most dating apps now have a function for reporting users who are scamming others or just being inappropriate. Reporting people isn’t only for you, it helps to protect everyone who is using the app. As the digital world becomes an intrinsic part of our lives, it’s important that you take steps to protect yourselves. Using a Burner number is only one way, but it’s a good first step. Use these tips and trust your instincts to help protect your privacy when dating online.